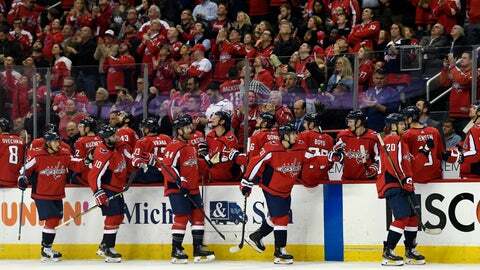 WASHINGTON (AP) — Nic Dowd scored the tiebreaking goal early in the second period, Braden Holtby stopped 33 shots and the Washington Capitals beat the Montreal Canadiens 2-1 Thursday night to clinch the Metropolitan Division title. Shea Weber scored for Montreal, which saw its playoff hopes dwindle with a game to go. Despite beating other division leaders in their last two games, the Canadiens entered Thursday even behind Columbus for the second and final wild card due to the regulation/overtime wins tiebreaker. Carey Price made 29 stops in the loss. SUNRISE, Fla. (AP) — Brock Nelson scored in the second period and then got the winner in the fourth round of the shootout to lead New York to its third win in four games. Thomas Greiss finished with 29 saves through overtime and thwarted all four Florida attempts in the tiebreaker. New York remained two points ahead of Pittsburgh for second place in the Metropolitan Division and home-ice advantage in the first round of the playoffs. The Islanders need to earn just one point in the season finale at Washington on Saturday to clinch second. Jonathan Huberdeau scored the tying goal for the Panthers with 7:15 left in the third period. Montembeault had 35 saves in his 10th NHL start. PITTSBURGH (AP) — Phil Kessell scored twice, Sidney Crosby added a goal and two assists and Matt Murray stopped 33 shots as Pittsburgh clinched a postseason berth for the 13th straight year — the longest active streak in the NHL. Jake Guenztel added his 39th for the Penguins, who welcomed center Evgeni Malkin and defenseman Kris Letang back into the lineup by racing past the Red Wings to extend a playoff run that began in 2007. Pittsburgh has won three Stanley Cups and appeared in another Cup final during that span. DENVER (AP) — Erik Johnson scored 1:49 into overtime, Philipp Grubauer made 34 saves and Colorado rallied from two goals down to clinch a playoff berth. EDMONTON, Alberta (AP) — Brent Burns had a goal and an assist to help San Jose win for just the second time in 11 games. Marcus Sorensen and Gustav Nyquist also scored and Aaron Dell finished with 26 saves for the Sharks, who improved to 2-8-1 in the last 11. San Jose has clinched second place in the Pacific Division and will face Vegas in the first round of the playoffs. NASHVILLE, Tenn. (AP) — Ryan Johansen scored with 19.5 seconds remaining, and Nashville preserved its hopes for a second straight Central Division title. Nick Bonino tied it up with 4:20 left when Vancouver goalie Jacob Markstrom got caught to the left of his net with Austin Watson sliding across in front of him. The Canucks lost their challenge for goaltender interference. Johansen’s pass across the slot to Viktor Arvidsson instead went off the outstretched stick of Canucks defenseman Troy Stecher and past Markstrom’s left pad and in. The Canucks also challenged, this time for offsides and lost. Colton Sissons also scored for Nashville, which now has won four of five. Markus Granlund scored and Tanner Pearson each had power-play goals for Vancouver, which snapped a three-game winning streak. TORONTO (AP) — Steven Stamkos had a goal and an assist, Andrei Vasilevskiy stopped 29 shots, and Tampa Bay became the second team in NHL history to win more than 60 games in a season. RALEIGH, N.C. (AP) — Justin Faulk scored the go-ahead goal in the second period, and Carolina clinched its first playoff berth in a decade. Warren Foegele and Nino Neiderreiter also scored to help the Hurricanes snap the NHL’s longest active playoff drought. The victory — coupled with Montreal’s loss at Washington — wrapped up Carolina’s first postseason berth since 2009 and just its second since winning the Stanley Cup in 2006. Andy Greene scored and Cory Schneider stopped 22 shots for the Devils, who have lost three of four and have clinched last place in the Metropolitan Division. Petr Mrazek made 35 saves for the Hurricanes. BUFFALO, N.Y. (AP) — Jack Eichel had a goal and two assists, and Buffalo snapped an eight-game skid in its final home game of the season. Buffalo is 2-13-2 in its last 17 games, and won in regulation for the first time since a 5-2 victory over Washington on Feb. 23. Carter Hutton stopped 21 shots. Anthony Duclair and Jean-Gabriel Pageau scored the Senators, who were already assured of finishing last in the overall standings. Joey Daccord stopped 35 shots in his NHL debut. ST. PAUL, Minn. (AP) — Jaroslav Halak made 26 saves for his fifth shutout of the season and 47th of his career, and short-handed Boston beat Minnesota. Alex Stalock stopped 32 shots for Minnesota, which has lost nine times in its past 13 games. ST. LOUIS (AP) — Alex Pietrangelo had three assists during the Blues‘ five-goal first-period outburst, Alexander Steen finished with two goals and St. Louis preserved its Central Division title hopes. St. Louis, which improved to 8-1-2 since March 16, remains one point behind Nashville, which beat Vancouver 3-2. Jordan Binnington made 26 saves and set a team record for wins by a rookie with his 23rd. Claude Giroux, Oskar Lindblom and James Van Riemsdyk scored for the Flyers. LAS VEGAS (AP) — Derek Stepan scored twice, Darcy Kuemper made 35 saves and Arizona defeated the Vegas Golden Knights. Arizona entered the day needing a win to stay in playoff contention, but was officially eliminated from the postseason when Colorado went into overtime with Winnipeg earlier in the night. The Avalanche needed just one point to clinch the final spot in the Western Conference. It marks the seventh consecutive season the Coyotes will miss the playoffs. Richard Panik and Conor Garland also scored for the Coyotes. Kuemper has started a career-high 55 contests and has won a career-high 27 games. Mark Stone scored Vegas’ lone goal and Marc-Andre Fleury made 30 stops in his first appearance since March 15.